Pamplin Media Group - Battling concussions: Where's the trainer? RATTLED: Small and rural schools in Oregon are least likely to have athletic trainers. Once classes let out for the day at Aloha High School, student athletes start lining up outside Shelly Jones' training room. Jones, the athletic trainer at Aloha, works quickly to "tape 'em or brace 'em and get them to practice." If an athlete recently became injured, Jones conducts a thorough, one-on-one evaluation, which takes longer. "We want to be able to spend some good time with them," she says. The athletes — "my kids," Jones calls them — sometimes wait two to three hours to see her. "We're seeing kid after kid after kid. We're so busy," she says. "And we have other athletes who say 'I saw the line, so I didn't come in.'" Athletic trainers are certified health professionals who work with athletes to prevent and rehabilitate injuries. They're also experts in concussions, helping student athletes heal and return to the classroom and the athletic field, making them a crucial part of a school's athletic program. 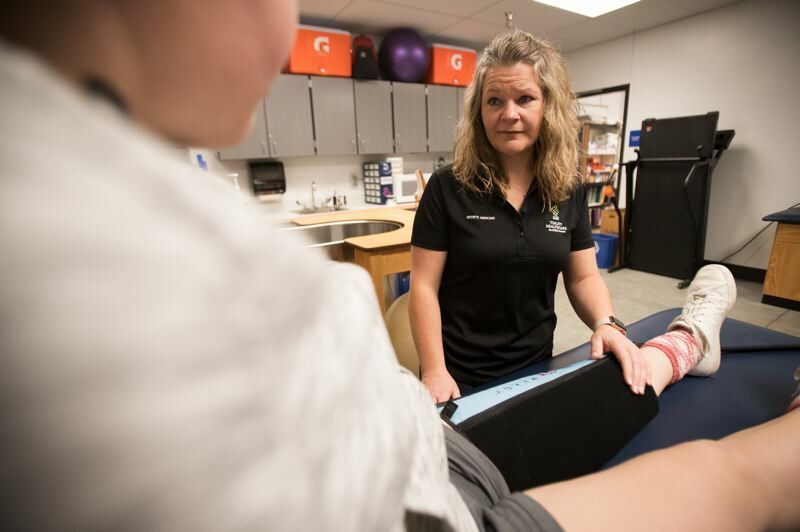 A recently released analysis by Pamplin Media Group, InvestigateWest and Reveal, shows that out of the 235 public high schools in Oregon, fewer than half have at least one athletic trainer. Nearly 47,000 students, or about 28 percent of students statewide, attend schools that do not have an athletic trainer. On Dec. 13, for example, the Seattle Children's Research Institute and the University of Washington Medicine's Sports Health and Safety Institute released the results of a two-year study that found concussions are more likely to be reported with an athletic trainer present. 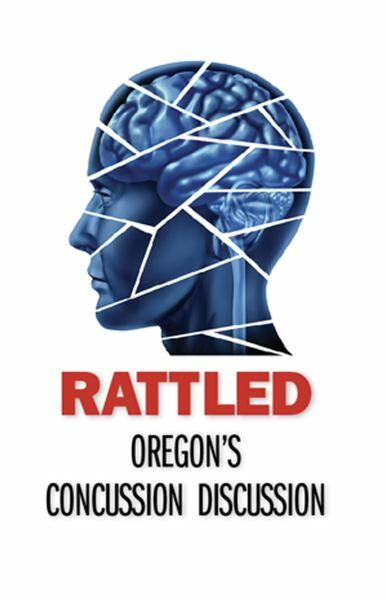 "There (is) essentially a direct correlation between the number of [reported] concussions with the total time that athletic trainers are in the building," says Dr. Mic Koester, an orthopedic doctor at Eugene's Slocum Center for Orthopedics & Sports Medicine who sits on the sports medicine advisory committees for the Oregon Student Activities Association and the National Federation of State High School Associations. "To me, that's a really important finding," says David Kracke, a personal injury lawyer and Oregon's brain injury advocate coordinator. "It suggests our kids are safer at games with athletic trainers. If we can afford to do so, we should have athletic trainers at as many games as possible." Hawaii is the only state in the country to provide funding to not one, but two athletic trainers working in every high school (see "Hawaii goes all-in"). While Oregon was one of the first states to pass a law requiring concussed high school athletes to be immediately removed from play, decisions about whether to hire athletic trainers are made by individual school districts. There are 366 certified athletic trainers working in Oregon, according to the Oregon Athletic Trainers' Society. There are different ways an athletic trainer can work in an Oregon school. "It depends from place to place," Koester says. "It depends on what (a school's) priorities are, essentially. They go through the budget and see if they can afford it." Some large school districts — including the Beaverton School District and the Eugene-Springfield school districts — employ athletic trainers as full-time employees of the school, with the money allocated in the school's budget. The region's physicians "recognized a need," says Sonja Donohue, the foundation's executive director. "There weren't any athletic trainers present at the games." Whether a school has an athletic trainer also depends on the size of the school and the school's athletic program. Sam Johnson, the president of the Oregon Athletic Trainers' Society, notes that many 5A and 6A schools, the largest in the state, have athletic trainers, while "not very many" smaller, more rural schools, classified as 1A and 2A, have them. "We don't have the numbers or the facilities or the money to do that kind of stuff," says Wayne Miller, a retired teacher and the athletic director of Griswold High School, in Helix, a tiny farming community in rural Umatilla County. Griswold High is a 1A school of less than 50 students. The nearest hospital is 17 miles away, in Pendleton. Whenever there is a serious injury and medical care beyond first-aid is required, Miller says, "I get them the heck out of here and get them to someone else." He, the athlete, and the athlete's family have sometimes had to wait an hour for an ambulance to arrive. As with any other aspect of rural life, "we're at the mercy of the surrounding areas," he says. Yet Miller says "we're making it work. We've been able to find people who can take care of our kids." 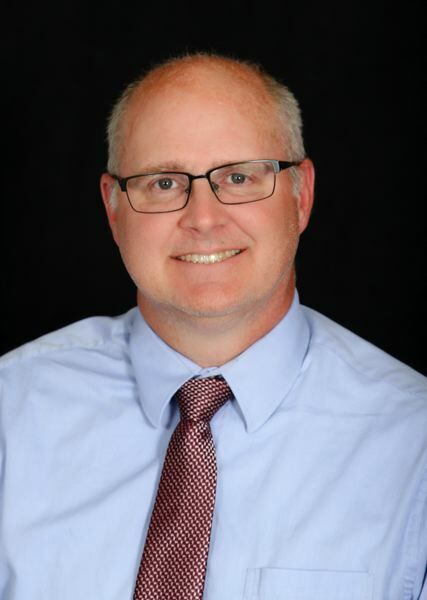 One of those people is Dr. Derek Earl, an orthopedic doctor in Hermiston, who splits his time between numerous, small rural schools in the Hermiston area, including Griswold High, Umatilla High, Echo High School, and Irrigon Junior/Senior High School. The care he provides differs depending on the school's needs: Sometimes he attends games and paces the sidelines, as many athletic trainers do. "Some only use me for concussion care," he says. Were it not for Earl, Miller says his athletes would have no ready access to medical care. "Working with Dr. Earl is huge," Miller says. And many schools simply do not have an athletic trainer at all. With the exception of Warrenton, no schools along the Oregon coast have an athletic trainer. The same goes for many schools in southeastern Oregon. Without an athletic trainer, there isn't a school employee with the expertise in sports medicine and physiology to "put an emergency action plan in place" if a student athlete becomes injured, Koester says. Kracke agrees. "We know from experience that having an athletic trainer on the field is much better than not with regard to health outcomes for our players," he says. "Having an athletic trainer on the sideline means that you have a set of professional eyes looking at the game through a medical lens." Providing care for the student also can be more cumbersome without someone with medical training at the school. "It may take more phone calls and more intervention on my part," Koester says. "It's just not the best situation." These issues extend beyond concussions. He has seen athletes with torn ACLs who return to practice too soon and athletes who play despite multiple shoulder dislocations. "No one says 'Hey, you can't play,'" Koester says. "There are acute injuries that turned into chronic injuries because there's nobody (at the school) who knows how to take care of them." This story has been supported by the Solutions Journalism Network, a nonprofit organization dedicated to rigorous and compelling reporting about responses to social problems, >www.solutionsjournalism.org.